A startup from Oakland, California is opening a new East Coast office in Baltimore City and looking to hire up to 50 people to staff it. Broadly.com has moved into the 7,500-square-foot third floor of the Union Box Co. building at 1820 Lancaster St. in Fells Point. This is the company’s third office location, and first outside California. CEO and co-founder Josh Melick said Broadly moved about eight of its employees to Baltimore to launch the new office, and the company is working to hire a staff of 50 people locally for roles in sales, customer support and engineering. Broadly aims to help small local service businesses, like auto shops, veterinarians and carpet cleaners, better connect with customers through technology. The company provides software that allows business owners to utilize the kinds of “modern conveniences” expected from companies of all sizes in the age of smartphones, Melick said, like text or web chat features and a streamlined web review process. Melick said the company is currently working with thousands of small businesses across the country, and has been looking to establish an East Coast presence in order to better serve clients operating in different time zones. It considered locations in states like Texas, Pennsylvania and Georgia, before settling on Baltimore. Baltimore is a good fit for the Broadly team, Melick said, because it “reminds us of home.” Oakland is a city with a lot of hometown pride, with a more “gritty, blue collar” vibe than other areas around the San Francisco Bay, Melick said. Baltimore has a similar character, he said, plus it offers proximity to universities and easy access to the greater regional tech and business ecosystems — and at an affordable price. 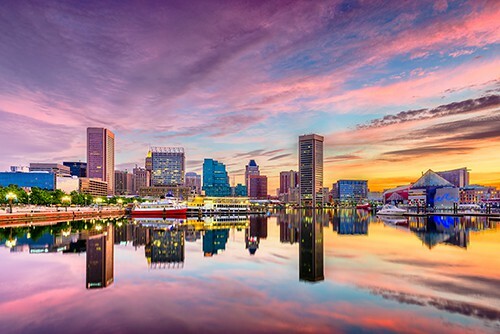 “Baltimore also offers us a strong customer base — and we’re looking forward to helping this city’s small, local businesses connect more effectively and quickly with their customers,” Melick said in a statement. Melick said Broadly hopes to grow to have 100 people working in the Baltimore area in the coming years. Broadly is backed by $22 million in venture funding to date, including its recent $10 million Series B that was co-led by Foundry Group from Colorado and Calibrate Ventures from California. It opened a second office in Los Angeles last year and employs more than 120 people. The company plans to host an open house at its new offices Wednesday, to meet and connect with local tech and business folks.